The Department of Land and Natural Resources (DLNR) asked beachgoers at Little Beach this afternoon to leave the beach due to a possible bomb they discovered. They asked people not to touch the wires at the beginning of the trail, the access path from Big Beach to Little Beach. They also closed off part of Big Beach closest to Little Beach and said a bomb expert is scheduled to investigate the wires tomorrow. The rest of Big Beach is considered safe and is still open. Exposed wires that are being investigated. Is there really a bomb? Beachgoers noticed exposed orange wires along the beginning of the path. 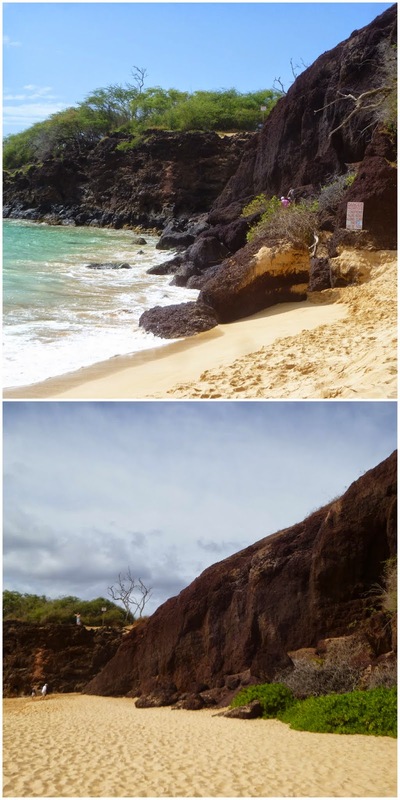 The wires have been exposed due to extreme erosion of the sand along the north side of Big Beach, as well as hikers walking along the inland access path over rocks and naupaka plants. Normally no one would walk in this area, but with the January displacement of sand, areas that are normally undisturbed are being used. By the way, every few years, the sand between the two beaches becomes displaced. Why would there be a bomb at the beach? One explanation is that during WWII and for decades afterwards, the island of Kahoolawe, across from Big and Little Beach, was used for military target and bombing practice. Remains from unexploded ordnance and other military practice exists in La Perouse (Ahihi-Kinau) and other parts of South Maui. 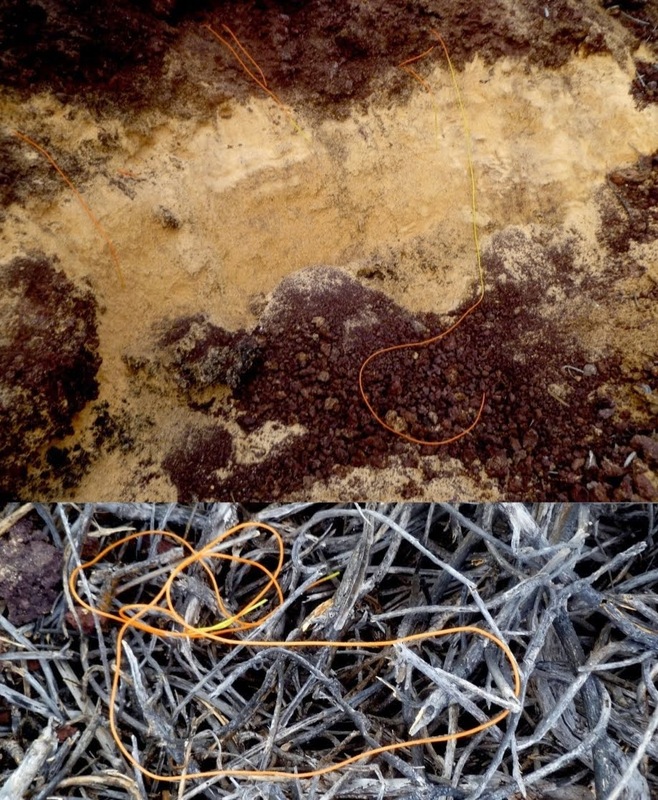 These orange wires may be residue from the war, or later military field exercises. 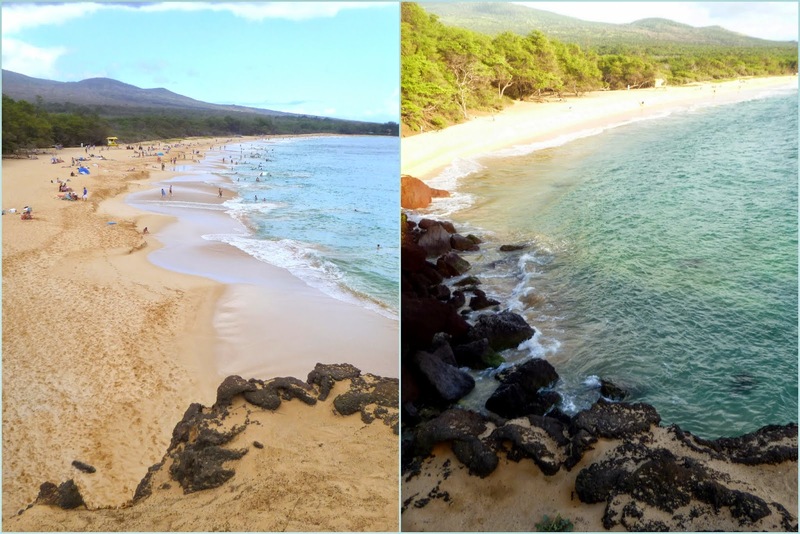 Path from Big Beach to Little Beach, Makena State Park. Top photo:current condition. Bottom photo: normal condition. The displacement of sand has exposed more rocks. Photos are not in the same scale. Tricky access path to Little Beach under current conditions. Little Beach and part of Big Beach are closed temporarily. Update 2/18/15: The beach has been reopened. No bomb was found. Good to hear there was no bomb! Does the sand return to normal conditions? If so how long does it take usually. Depends on the surf and weather conditions. This time, I think it took 2 months. The sand washed away in January and came back in April. It happens every few years that the access is this difficult. During the course of the year, the sand can wash away to a lesser degree.